The Rose01277 218809work RestaurantOpening after a major refurbishment the Rose is bringing fine dining and a great family experience to Shenfield. With everything you would expect from a traditional pub, the menu is full of classic traditional English food with a modern twist. All accompanied with fine wines and a good selection of beers. Open every day food is served from midday until late into the evening including a traditional Sunday Roast. A warm welcome is a guaranteed with the natural log burners always on but also from the friendly management and staff. 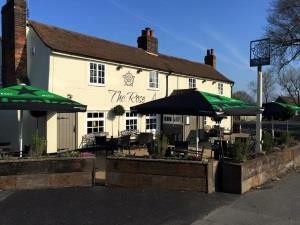 The pub is in two sections with a dedicated dining area and a comfortable bar area. During the warmer weather the outside turns itself into an alfresco dining experience including a covered non-smoking area. With ample parking the Rose is not just a local but the perfect destination venue. Opening after a major refurbishment the Rose is bringing fine dining and a great family experience to Shenfield.